The basic features of Chocolate Lovers Passions are free to use (if Chocolate Lovers Passions is the primary site you join within Passions Network). Members can send/receive email, post photos, send 'Smooches' (and perform other 'Actions', join Groups, chat, tag members, add Favories / Friends and much much more. There are additional options within Passions Network that do require a paid upgrade, but they are only options and they are not required to fully enjoy the beneffits of Chocolate Lovers Passions. How does Chocolate Lovers Passions differ from other online dating sites? 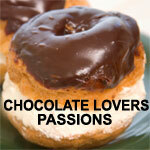 Chocolate Lovers Passions is part of the Passions Network niche dating social network. The focus of the sites within Passions Network is to help people meet others who share similar interests, and unlike most dating sites, individual sites within Passions Network do not cost anything. Upon joining Chocolate Lovers Passions, you become a member of the Passions Network network of sites, with the option to add other Passions Network sites into your account if you choose*. Please note that you will only appear on the site(s) in the network that you add into your account. This approach lets people create their own personal social network of dating sites, customized specifically to their particular interests (or passions) in life. *Adding additonal sites into your account can only take place by upgrading to a 'Network Wide Membership'. 'Groups' allow you to further define a little of who you are, within individual Passions Network sites. 'Groups' also allow you to find people who share some similarity with you, whether it be a personal trait or a specific interest...and hopefully this will make it easier to break the ice and make new friends. Take a moment to browse some of the Chocolate Lovers Passions Groups to see how they work. If you have already have a website or blog, add a link to Chocolate Lovers Passions. How can I help promote Chocolate Lovers Passions? Link to Chocolate Lovers Passions. Tweet about Chocolate Lovers Passions. Blog about Chocolate Lovers Passions. Create and upload a YouTube video about Chocolate Lovers Passions. Click the Google+ button on the Chocolate Lovers Passions homepage. Click the Facebook Like button on the Chocolate Lovers Passions homepage.